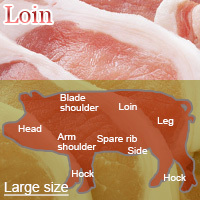 Pork loin is a primal cut located around the back and before the thighs of a pig used for ham. It is used to make sauteed pork, pork roast, and cut into chops. Fatback from pork loin can be used to make lard in addition to being used in grown pork and sausage. The calories in Pork Loin per 100g(1cut ) is 263 calories. Pork Loin is calculated to be 263Cal per 100 grams making 80Cal equivalent to 30.42g with 19.3g of mostly protein、19.2g of fat、0.2g of carbohydrates in 100g while being rich in vitamins and minerals such as Selenium and Vitamin B1.